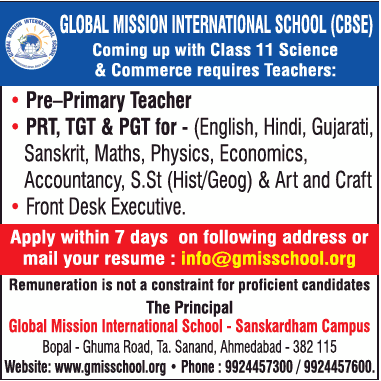 Global Mission International School, Ahmedabad has advertised for recruitment of Teaching Faculty- Teachers PGT / TGT / PRT / PPRT jobs vacancies. Interested and eligible job aspirants are requested to apply within 07 days from 20th March 2019. Check out further more details below. About School: Mission- Will ensure that students get a conducive learning environment with a wide range of curriculum supported by best of pedagogy and latest in technology, that nurtures lifelong learning, creativity and innovation. Will provide thoughtfully balanced academic experiences to prepare our students to succeed in a rapidly changing society. Will nurture students with strong cultural values to help them become engaged citizens contributing to solving the pressing global challenges.